Interfacing with Digital Calipers « Adafruit Industries – Makers, hackers, artists, designers and engineers! Interfacing with Digital Calipers via EMSL link blog. 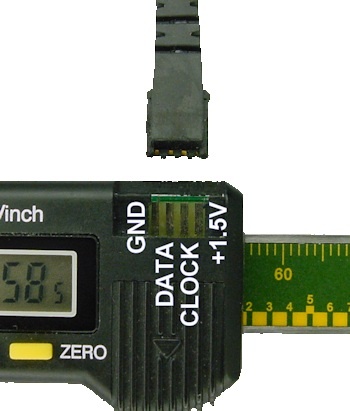 Besides the LCD display, many calipers have a digital output port for their data. Name-brand calipers charge significantly more money for the inclusion of a data port, even though they often build it into all of their models, only to be hidden by the plastic case. Calipers with data outputs can be used as positioning sensors in robotics by attaching one caliper jaw to a moving part, and the other jaw to a fixed part. The absolute and relative position can be determined to a hundredth of an inch. Many hobbyists attach calipers to their milling machine to create inexpensive digital readouts (DRO). Another potential reason to interface to an electronic caliper is to quickly log dimensions for statistical analysis or quality control. In order for a microcontroller to read a caliper, you need to know the pinout and data format. These specifications vary from manufacturer to manufacturer. This article provides the measured timing and bit formats for two brands of digital calipers that I own.